Kelley Blue Book’s KBB.com car-research service has named the five-passenger Hyundai Santa Fe Sport among Best SUVs under $25,000 – for the third year in a row – recognizing one of the best values for consumers looking for an economical family friendly crossover. “In 2014, compact SUVs became the best-selling vehicle category in the country and the Santa Fe family took advantage of this with sales up 21 percent,” said Mike O’Brien, vice president of corporate and product planning at Hyundai Motor America. “With high consumer demand of compact SUVs continuing this year, the Santa Fe Sport stands out for its class-leading design, outstanding quality, great utility and advanced technologies like BlueLink – all raising the driving experience for its owners,” he said. Hyundai made some tweaks to the Santa Fe Sport for 2015, including steering enhancements and the addition of more standard features. Also new is Hyundai’s Power Hands-Free Liftgate with Auto Open, which is a great help when approaching the cargo area with a load of groceries in your arms. Two years ago, the Santa Fe midsize crossover entered its third generation, coming this time in two versions: the five-passenger Sport, and a long-wheelbase version, called just the Santa Fe, with seating for up to seven. The Sport models are smaller, lighter and less-expensive, ranging from $24,950 for the base front-drive model with a naturally aspirated 2.4-liter four-cylinder engine (190 horsepower) to $33,000 for the top-of-the-line 2.0-liter turbo four-cylinder all-wheel drive with (264 horsepower). The longer Santa Fe is offered in two versions: the base GLS model, and the uplevel Limited, which we tested for this report. Front-wheel drive is standard and was included on our tester, but both models are available with all-wheel drive. For 2015, long-wheelbase Santa Fe Prices begin at $30,150 for the GLS front-drive, and $31,900 for the GLS all-wheel drive. The 2015 Hyundai Santa Fe Sport comes with room for up to five people; there also is a long-wheelbase version called simply the Santa Fe, which can seat up to seven passengers. Limited models start at $34,250 for the front-drive, and $36,000 for all-wheel drive. Also available for the same prices are Limited front- and all-wheel-drive models with a special Saddle interior color. Long-wheelbase models come only with a 3.3-liter V-6, which cranks out an impressive 290 horsepower and 252 foot-pounds of torque. 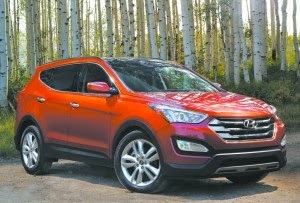 All Santa Fe models, short and long, have a six-speed automatic transmission. EPA ratings for the V-6 are 18 mpg city/25 highway/21 combined with front drive, and 18/24/20 with all-wheel drive. The Santa Fe’s exterior styling was created using Hyundai’s “Fluidic Sculpture” design theme, which has been showing up on newer models throughout the line to give all Hyundai models a similar, distinctive appearance. To create “the illusion of constant motion,” the designers used a three-bar hexagonal grille, LED headlight accents, a low stance with a rising beltline, a roof spoiler and special wraparound taillights, the automaker said. Standard are 18-inch alloy wheels, and the rear end is squared off more than that of the shorter Sport version, specifically to allow for more room in the third row, and more cargo space behind the third seat. Also included are dual chrome exhaust outlets and a flush-mounted tow hitch. It’s a pleasing design, and it even carries over into the well-appointed interior, which looks more like that of a luxury crossover. 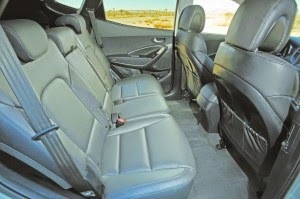 Standard on the GLS is seven-passenger seating, with two front bucket seats, a three-person middle bench seat, and a two-person third-row seat. But the Limited model also is offered with six-passenger seating, using two captain’s chairs in the middle row rather than the bench. There is just 13.4 cubic feet of cargo space behind the third seat, but that expands to 41 cubic feet with the third seat folded. The rear hatch lifts up in one piece, and is power operated on the Limited. All Santa Fe models come with Hyundai’s Hill-Start Assist Control and Downhill Brake Control, which help negotiate steep hills. Standard safety features include antilock brakes, front seat-mounted side air bags, side-curtain air bags for all three rows, driver’s knee air bag, electronic stability control, traction control, and tire-pressure monitoring. The climate-control system includes an automatic defogging system, designed to detect humidity in the cabin and keep the windshield clear. It also features the CleanAir Ionizer, which filters the air when the heater or air conditioner is on. With the V-6, the Santa Fe can tow trailers weighing a maximum of 3,500 pounds.